Photographs where the wider terrestrial landscape forms the major part or focus of an image. These may contain water bodies, mountains, hills, trees, copses, woodland and man-made artifacts in the environment such as buildings and constructions. Photographed on the Sunday 30 January 2011. 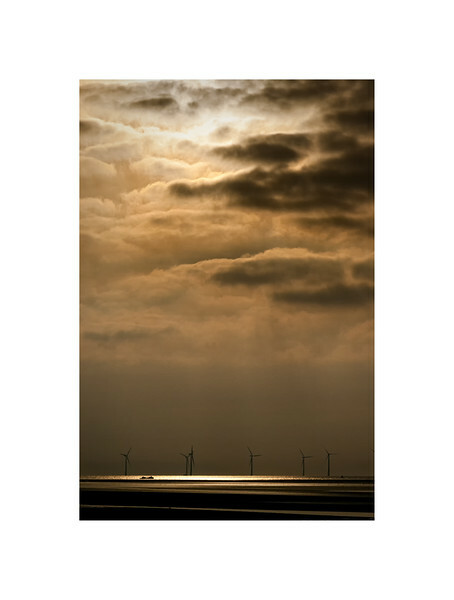 A moody image with interesting light showing the juxtaposition of an old shipwreck against the modernity of the windfarm. The wreckage is the remains of the cargo ship Ionic Star, which has been embedded into the sands off Formby since October 1939. The vessel sank close to the end of its journey from Rio de Janeiro to Liverpool. Close by but not visible is another shipwreck, that of the Bradda which also sank in 1939. Behind the wreck can be seen the offshore windfarm of Burbo Bank.